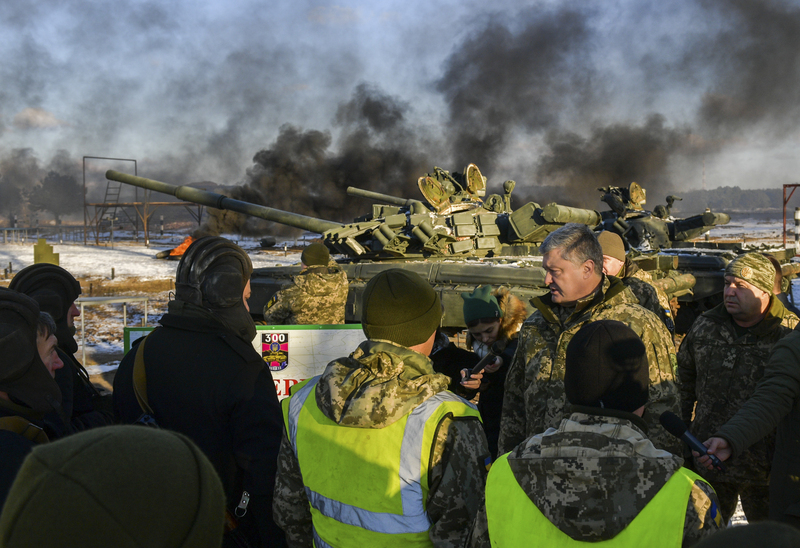 Tensions between Russia and Ukraine have been rocky since Russia forcibly annexed the Crimean Peninsula from Ukraine in 2014. Now a bad situation is getting worse. Yesterday, Ukraine’s Ministry of Infrastructure claimed Russia has blocked 35 merchant ships from leaving or entering the Sea of Azov. The Kremlin denies the claim. The Ukrainian ministry says 18 ships were stuck in the Black Sea waiting to pass through the Kerch Strait, into the Sea of Azov. They also claim another 17 vessels were unable to sail out of the Ukrainian ports of Mariupol and Berdyansk on the Sea of Azov. Kremlin spokesman Dmitry Peskov insists Russian authorities haven’t imposed any restrictions and that the logjam could be linked to poor weather. Tensions between Russia and Ukraine have escalated after a weekend incident in which the Russian coast guard fired on and seized three Ukrainian navy vessels and their crews near the Kerch Strait. President Petro Poroshenko says Ukraine’s government will impose unspecified restrictions on Russian citizens in response to the seizure of the three Ukrainian vessels and their crews. The Ukrainian leader tweeted yesterday: “There will be restrictions regarding Russian citizens, which I believe are quite justified.” Ukrainian authorities have already denied entry to an increased number of Russians following the weekend incident. Poroshenko says further pressure needs to be put on Moscow by members of the North Atlantic Treaty Organization (NATO). He is urging NATO to deploy naval ships to the Sea of Azov amid the standoff. Russia is just a big bully! They can't seem to get along with anybody! They've gone to far! recently Russia and Ukraine were in the midst of a war, that might be part of this. America should step in. It's easy to see Russia as a big bully. I'm 17, American and I grew up in Moscow Russia. One thing I know from being on both sides of the spectrum is, that Russia has had its moments where it is a bully. Ukraine is a former Soviet-controlled area, and when I travel there I see virtually no difference between Ukraine and Russia itself. America also has its moments of being a bully. Take Hiroshima for example. It's not widely known, but Officers in Japan were about to surrender when America dropped a nuclear bomb on them. It was dropped to be an example of our power to Russia. Hundreds of thousands of innocent lives died because of that one American act. America had concentration camps IN AMERICA for Innocent Japanese people in WWII. Not because they had done anything wrong, but simply because they were Japanese. And these concentration camps were HORRRIBLE. America plays policeman of the world and it's not right. That's what the UN is for, as well as organizations like UNICEF (which has its own private army). Every country and man who has power is corrupted by it. That's biblical. I agree with you Anthony M.
America should NOT step in.